Wow - time just flies, doesn't it? I can't believe it's already been a week since we were with The Crow girls in Omaha! We had such a great time and learned a lot too. I have to say that I was a bit skeptical about their applique technique, using glue sticks and a stapler, but...IT WORKS! And...I am the proud owner of a new, long arm stapler (found on Amazon for only $13 and no shipping!) The girls are so much fun, so creative and just an all around fun time. I will go back and start from the beginning - I was trying to decide which quilts to take for the little trunk show that Lyn asked me to do. Of course, Callie had to help. I thought of packing her up and taking her along, but I don't think she would have liked our room mates. Lyn from More Sew For You was kind enough to let us stay with her, and she has 3 adorable dogs. I loved them all, but don't think that Callie would have shared that love! On Friday and Saturday the classes were at a hotel in Omaha, so we were set up there. 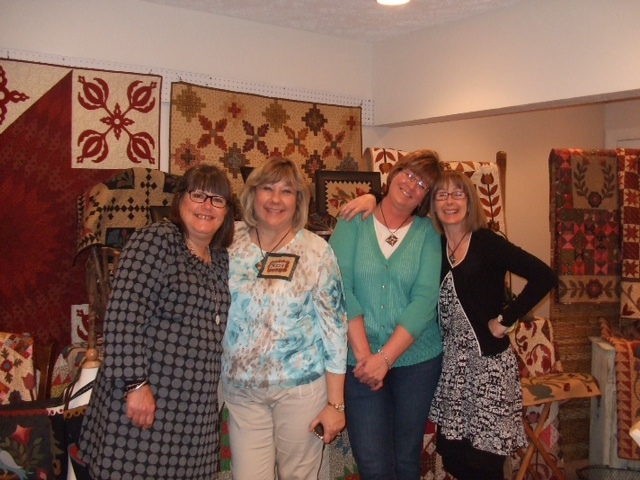 The Crows shared a wonderful trunk show with us on Saturday. Here are just a few pictures. I really do love each and every one of their quilts! And look at what one of the students gave me...a fun goody bag (can't call it a scrap bag - these were way bigger than scraps!). These were from Susan - she has a pumpkin scissor fob that was broken and we fixed it for her - this was my thank you! WOW! You will definitely see some of these in future projects! On Sunday the class was at Lyn's shop. The Crow Girls taught in the classroom downstairs(surrounded by all of their beautiful quilts!) and Missie and I had our things set up in the shop upstairs. Here is a picture of the four of us after classes. From L-R - Crow Deidre, Missie, me, and Crow Leonie. Have I mentioned how much fun they are!? 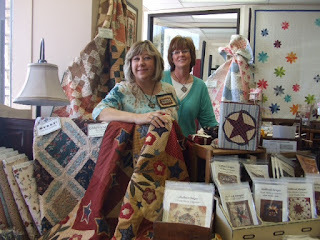 And here is a pic of Missie and I upstairs - you can see her quilts and patterns and some shop samples. I just love the quilt that she has her arm on - it's called Brookshire Star. You can see all of Missie's patterns on her website - be sure to check out her punch needle coasters - they are also one of my favorites (I can't pick just one favorite - I love all of her patterns!). 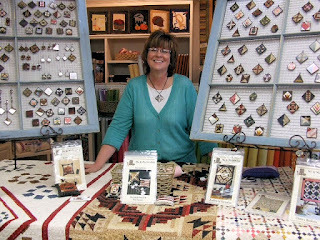 Here is a picture of me and my little set up at Lyn's shop. These displays are new - we made them using some old windows. We had a great time and met some wonderful people. Thanks again to everyone - Lyn and her husband for allowing us to invade their home, and for feeding us and taking such good care of us. 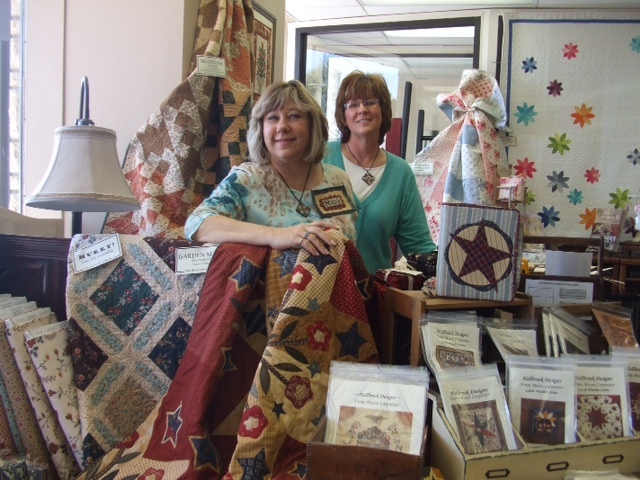 The Crow Girls for sharing all of their knowledge and expertise and beautiful quilts. And to all of the class attendees for their kindness and friendship. Make sure to read Missie's post too - you will find some funny sayings from The Crows that kept us laughing the entire time. And the fun didn't stop there! When I got home there was fun mail waiting for me! You know how much I love fun mail! A few weeks ago, I won a giveaway on The Patriotic Quilter blog. I was so excited, because the giveaway was one of those little lights from IKEA - you know the ones - they have been all over blogland, but there are no IKEA stores in my state! Well, as if the light itself was not enough - look at all of the fun stuff that was in the box with the light! 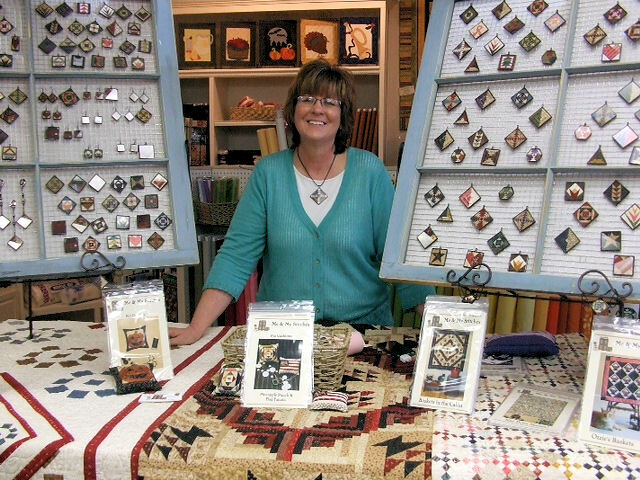 Now that's a lot of fun, quilty stuff! What a great end to a fun weekend! But the fun didn't end there! The next day, Marty the Mail Lady came through for me again! Another fun mail day! A box from Aunt Nancy! (You can tell how excited I was by all of my exclamation points!). Look at all this stuff - I've always wanted to try these clips for binding, and now I will be able to - that is if I ever finish a quilt. And a little bit of chocolate will always brighten the day. She sent 2 little scrap bags - one from her and one with the batiks, from her friend Bev. FUN! Gosh, I just love fun mail. After all that excitement, I have spent the week trying to catch up on everything. I had several orders from Omaha that I've been working on, plus paperwork, sales tax (thank you to the state of Nebraska, who makes it much simpler than most states), a little cleaning, etc. I'm trying to finish that quilt (you remember...the one my DH thinks is ugly) that's been on my design wall for far too long. I've got a lot of ideas swimming around in my head for some new designs, so hopefully I will be able to work on that in the near future. I've had a little glitch on my website that I've been dealing with most of the week - I think I've got it solved now. And while I was at it, I added a bunch of new pieces of jewelry - so be sure to go take a look - there are new items in all of the categories - pins, pendants, earrings and scissor fobs. And now, I better get back to work!